In any case, I get my passion for material possessions from my mother who got it from her mother. I don't feel badly about my dedication for aesthetically pleasing, material possessions because I feel as though it is my pedigree. We have never acquired items of beauty to impress anyone or to out-do anyone. My mother and I have a deep appreciation for well constructed items, design, fashion, beauty and that is where our motivation comes for these purchases. I was in Venice, Italy and I saw these handbags in the windows of the finer shops along St. Mark's Square or Piazzo San Marco. As I would walk up and down the narrow streets, I would see these bags and with each step I grew more and more fond of the style, shape, colors and the Venetian essence that the bags embodied. Finally, I got to a point where I needed to know who the designer of these bags were - as I had never seen or heard of them in the United States. A store clerk told me that the bags were Roberta Di Camerino and that the designer was local but sold throughout the world in finer stores. In the U.S. the handbags are sold in Neiman Marcus, Bergdorf Goodman and Barney's New York. It didn't really matter to me where the handbags were sold as I was already in love. It was a difficult decision deciding which bag I would purchase and what size. 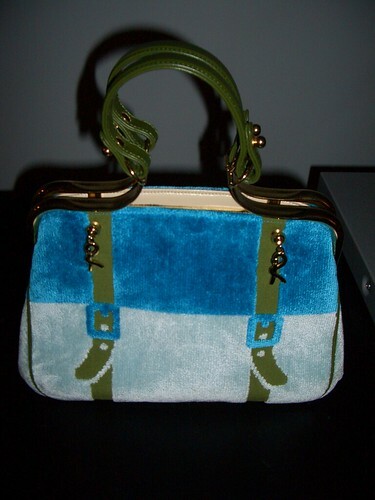 Many of the bags have bold, deep colors but the one I chose was a pale shade of blue with a deep green handle. The velvet is divine. I think the reason I love my Roberta Di Camerino bag so much is because I fell in love with Venice when I was there and Guiliana Camerino (the designer) is a native resident of Venice. When I asked around about the bags, people who lived in Venice had wonderful things to say about the designer. I also love the bag because I see it as a piece of art. I like that most people do not know the brand, the women who carry these bags are women who know and appreciate the beautiful craftsmanship. When I see a woman carrying a handbag with the bronze "R", I have instant respect for her sense of style. These shoes are the newest addition to the collection of items which keep me from owning a larger condo or saving for retirement. I love these shoes. I stand nearly 5'11" in these shoes (I am 5'5) and I am not ashamed to wear them in nearly any situation. If I told you these shoes were comfortable, you would likely not believe me, but I am telling you, they are comfortable. Well, comfortable in a relative sense. When I put these shoes on my feet, I am instantly beautiful. My feet look amazing. Something just happens where you feel special, fantastic and gorgeous. You might be thinking "Well, that is really sad that you need a pair of shoes to make you feel special" - I don't really care if you feel that way. Put these shoes on and you tell me how much of a princess they make you feel. They make my legs look like they go for miles and I look incredible at the craps table at the Bellagio. Ok, those are awesome shoes. the dorkiness of that denim jacket cancels out the beautiful shoes. But you do look great in that photo otherwise. aren't you glad i faithfully read your blog? i love my denim jacket!